Tour Confidential: Does the new rule that exonerated Tiger Woods violate the spirit of the game? Tiger Woods surveys the scene during the second round of the Hero World Challenge. Check in every Sunday night for the unfiltered opinions of our writers and editors as they discuss the hottest topics in the sport, and join the conversation by tweeting us @golf_com. Tonight we discuss Tiger Woods's rules fiasco from the second round of the Hero, his schedule for 2019, Patrick Reed doubling down on his post-Ryder Cup comments and more. 1. Tiger Woods wasn't penalized for double-hitting a shot out of the bushes on Friday at the Hero World Challenge, even though he admitted it was double-hit after seeing the slo-mo replay. 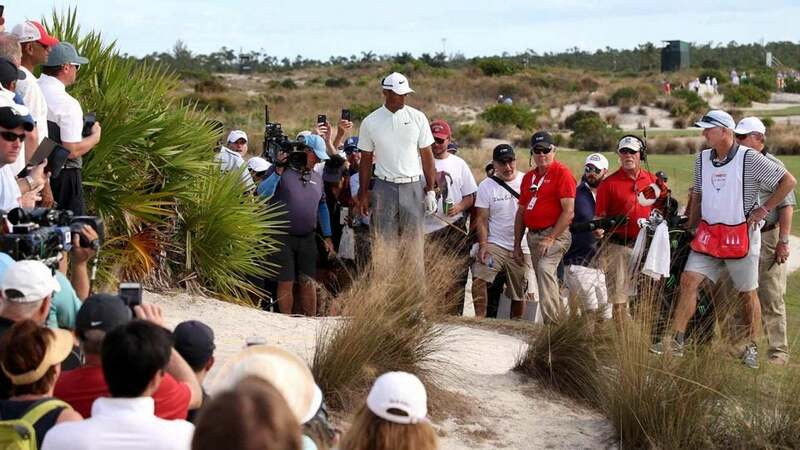 (According to a recent rules revision, Woods was not penalized because HD slo-mo video replay was required to see the violation and Woods couldn’t have been reasonably expected to detect the double-hit in real time.) Our Michael Bamberger argued that Woods did the right thing “for himself and the game” by not taking a penalty even though he could have. Any issues with the HD rule? Does it in any way violate the spirit of the game? Sean Zak, assistant editor (@sean_zak): The “right thing” that Tiger could have done was 1. Take a legit backswing, whether that’s two inches or two feet. Then 2. Hit the ball forward and think about how that felt. If you do both those things legitimately, and think you only hit the ball once, didn’t scoop or push the ball, then yes, Tiger was fine in what he did. I’m very skeptical about it, beginning with the lack of any backswing. That being said, I have no issue with the high-def rule, as long as players are honest enough with the entire process. Kudos to the first player who rewatches something in HD and notices that, “Yeah, that did feel weird,” en route to penalizing themselves. Dylan Dethier, associate editor (@Dylan_Dethier): I was initially of this same camp, that this was the perfect opportunity for Tiger to step up and show his appreciation for the integrity of the game and all that — quieting any doubts about previous sketchy rulings in the process. But Bamberger’s piece has me convinced that Woods did the right thing for his fellow players. The way the rules are now set up, players should accept the rulings handed down by officials. Golf’s officiating is getting more similar to other sports, and I think that’s okay. Josh Sens, contributing writer (@JoshSens): Dylan mentions those previous sketchy rules incidents, and it’s hard not to look at this weekend in the context of those prior moments. To my mind, Woods did indeed miss an opportunity to make an “I’m not bigger than the game” gesture and say, “You know what? Looks like I did hit it twice,” and call a penalty on himself. In his column, Michael wrote if Woods had done that, he would have placed an unfair burden on other players to do the same. I’m not convinced that’s really is an unfair burden. It seems like the least we can ask, no? I’m open to being persuaded otherwise but haven’t yet been. Alan Shipnuck, senior writer (@AlanShipnuck): We all know I’m Bamberger’s de facto publicist but I have to part company with him here. A player with Tiger’s exquisite feel has to know if he hit the ball twice — the hitter always knows. He shoulda manned up and taken the penalty. Michael Bamberger, senior writer: I don’t know if my judgment is being clouded here by my overall positive impression of Tiger’s evolving personality. I’m not sure he double-hit it at all. I wonder more if he scooped it or pushed it. Hitter does know, as Alan points out, in normal conditions. These were unusual, because of the short, flat swing, the bush fronds, the sand. I really am inclined to believe him, despite Woods’s poor track record. I do think, Josh, if you honestly could not have known without intense photographic evidence, it’s asking too much of the player. We’re going to find, and only more so in the future, that when a player puts his clubhead down to address the ball, especially in the rough or on zoysia fairways, that ball moves insignificantly. That should not be a penalty. Now if you review and conclude, “I can see it now and I should have seen it then,” then you should call it on yourself. But Tiger’s situation was not — I don’t think — that. He still had a bad 2013, rules-wise. Brandel had it right then. 2. Woods said Sunday he's still ironing out his schedule for next year, although he did say he won't be playing as much as he did in 2018. While that news isn't necessarily surprising, Woods might have to say no to many events he's played in past years. Last season he played 18 events — 20 if you include the Hero and Ryder Cup. Put on your Woods whisperer hats and tell us what Woods should, or shouldn’t do, when it comes to his 2019 schedule. Zak: I think he should do exactly what he did last year because it was enough competitive golf to get him fine-tuned but not so much golf that he was too worn down to compete at a high level at any point in the season. So, that means something like Torrey-Riviera-Honda-API-Players-Masters, etc. Throw in another event when it feels right and he should be able to contend in all the big ones. Dethier: I’m just sad he’s not going to play the Valspar...I was there last year and boy did the Tampa crowds love them some Tiger. But if The Match and the Hero reminded us of anything, it’s that an apathetic Tiger doesn’t do anything for the game anyway. Fewer is fine. Sens: I’m with Dylan here. Scarcity is a powerful commodity. It’s also good for a 42-going-on-43-year-old surgically repaired back. Shipnuck: Since the U.S. Open is being played at Pebble Tiger would be crazy not to play the Clambake, which means dropping Riv the following week. Yeah, his foundation is now involved in that event, but this year made clear he needs to be ruthless in his scheduling and preparing for the U.S. Open is more important. Ditch Bay Hill and Valspar. Add the new event in the Twin Cities, which is midway between the Opens. Skip the middle FedEx Cup event because his back is more important than the points. Bamberger: I admire Alan’s Chamber of Commerce position. C’bake does not help you for June at Pebble and maybe hurts. Eighteen seems like too many. Hard to say no to Bay Hill. You could see him not playing The Players, except for the fact that Tiger never does anything eccentric. 3. Tony Finau entered the final round of the Hero tied for the lead with Jon Rahm and Henrik Stenson but made a costly double bogey and two other bogeys to shoot 69 and finish alone in 2nd. The 29-year-old entered the week with the most top 10s without a win since the 2016-17 season (20), 10 more than the next guy, Luke List. Are Finau’s Sunday woes evidence that he lacks the clutch gene? Zak: No, screw the clutch gene. Rory McIlroy hasn’t been much different the last few years, and we know damn well he still has a tendency for “clutch” golf. Finau is still ascending. He’s just played his first Ryder Cup. He’s a newbie to the world top 15. You play A LOT of clutch golf to get there. He’s also just kind of now feeling like he can stand up among his peers — the best in the world. Let’s not treat the many top 10s and few wins as a bad thing. It’s a process, and Finau is going to have a yooooge 2019. Book it now. Shipnuck: Wait, Rory is still clutch? I hope that’s true because his soft play in clutch situations over the last couple of years has left me wondering. Anyway, I salute Finau’s consistency, and it’s true that learning to win is a process, but he has now had a ton of experience in these situations. It’s time to cash in a few of these opportunities. Dethier: I’m not much of a “clutch gene” guy either, but there’s a little something more than randomness to this: Finau hasn’t been quite as good on the weekend and hasn’t thrown down a door-slamming win. He’s not a stone-cold killer yet, but that’s not to say he’s incapable. Sens: I am an ardent believer in the clutch gene. There’s little doubt that some players bear up to pressure better than others. But I don’t sense that’s the issue with Finau, who held up pretty nicely in the cauldron of the Ryder Cup. I think the issue is that it’s very difficult to win on the PGA Tour. Finau will be back in the winner’s circle before long. Bamberger: Finau is such a jock and such a work-in-progress I suspect his Sunday play is the last real missing piece in his golfing evolution and the only way to get better at it is to fail first. He’s doing the first part now. He’ll get the second part soon enough. Jon Rahm shot 65 on Sunday to win the Hero. 4. Finau’s playing partner at the Hero, Jon Rahm, made no mistakes on Sunday. He was bogeyless en route to a 65 and four-shot victory. While Finau couldn’t keep pace with Rahm, he did birdie the 72nd hole to prevent Justin Rose from taking over the No.1 spot in the World Ranking from Brooks Koepka. That top spot has been held by several different players in the last few months. Does Rahm get there at some point in 2019? Zak: I’ll take the easy route and say no. There are too many phenomenal players for him to compete with for that top spot. He plays well in a lot of big events. He’s really good. But the lot of DJ, Rose, Koepka, Thomas, et al are an easy team to choose over Rahm getting to No. 1. Sens: Any number of guys could get scorching hot and snag No. 1. It’s been happening over and over the past few years. But Sean has it right on the odds front. Stellar as he is, Rahm would not be listed as a favorite to grab it, not with so many others in the running. Dethier: Nah, I don’t think he gets there. But will Bryson?! Shipnuck: This was actually an important win for Rahm, who since his victory at the Hope in January had been pretty quiet. He’s so young and talented it seems likely he’ll get to No. 1 at some point but I don’t think 2019 is the year, given how stacked the top of the Ranking is. Bamberger: Number 1 is a fluky thing and predicting who gets there is beneath the high-octane abilities of this distinguished group. I’d be more interested in hearing whether we would bet real money at low odds that he would win a major in the next five years. And I would bet yes. Augusta, in the 2020s. Might contend in some others. 5. Patrick Reed reignited the story that's rocked the golf world since the Ryder Cup when he spoke with the New York Post at the Hero World Challenge. Reed, doubling down on his post-Paris comments, said it was unwise to split up him and Spieth and Justin Thomas and Rickie Fowler and that he's been treated unfairly when compared to Phil Mickelson's 2014 Ryder Cup remarks (Mickelson was praised by many for calling out his captain, Tom Watson). Does Reed have a point? Zak: He does...and he doesn’t. To say that there’s a double standard with Mickelson is correct, but it fails to recognize WHY a double standard has always existed with the Ryder Cup. Mickelson earned that double standard. Sometimes when you’re a 20-something and still learning things in the public sphere of the PGA Tour, you’d be keen to note how a 48-year-old has done exactly that for almost as long as you’ve been alive. Also, the U.S. won at Hazeltine, which validated Mickelson. If Reed plays well on a winning 2020 team at Whistling Straits, he’ll be forgiven. Dethier: This is the same guy who said Spieth got different rulings and took a complaint about Red Sox tickets public, among other things. His shtick of perpetual unfair treatment is not lost on golf fans. But he’s still a breath of fresh air and he has made (some) sound points about the team’s construction. More Reed interviews, please! Sens: Who said life is fair? And as Dylan points out, Reed’s sense of justice is a fairly privileged one. But I do admire the forthrightness. What you see does appear to be what you get with Reed. And it’s certainly not dull. Shipnuck: Why does Jordan have to be the one to pick up the phone? Unlike Reed, he played his heart out in Paris. Now that we’re reminded yet again of Reed’s dysfunction, who can blame Spieth for wanting a new partner?! As for the Mickelson jab, it misses an essential point: Phil’s comments were a calculated attempt to bring about systemic change, not a cop-out for his own abysmal play. Bamberger: Phil’s comments were rude and effective, because he has been one of the prominent players in the world FOR TWENTY-FIVE YEARS. Patrick Reed is just topping off his second cup of coffee. Cool your jets, kid. Also, truly, this is not rock-our-world stuff. Koepka winning two majors is rock-our-world stuff. This is just blah-blah-blah mindless entertainment. Not that there’s not a lot of that going around these days. 6. How many mulligans are too many mulligans? Our etiquette expert, Josh Sens, broke it down for us last week. What's your policy when it comes to this controversial practice? Zak: My father is barely a golfer, but he has long believed in this rule: one mulligan, to be used exclusively with tee shots, per nine holes. It makes for closer matches, especially with players who are susceptible to the blow-up hole. Sens: “Etiquette expert?” You clearly haven’t seen me fight my kids for the last egg roll. Though it’s probably poor etiquette to agree with myself, I’ll double down on what’s already on the record. One is ok on the first hole if agreed upon by all beforehand. Multiple mulligans or mulligans taken anywhere but the first hole are okay too, but only if you have no shame and are not really playing golf. That’s called practice, and it’s acceptable. Just call it what it is. Bamberger: The Etiquette Whisperer, Mr. Sens, speaks for me. One if you haven’t been to the range. Otherwise, none. Not that I would take one. If I can find it I want to play it, just in case I shoot a course record that day. (I did once shoot 77.) Dethier: As I’ve started playing less golf I’ve become increasingly fond of the breakfast ball. Everyone should start off the day with a good swing, and it lessens first-tee jitters. After that, I’m anti-mulligan...but I’m all in on extremely generous drops, especially if a player is struggling. Shipnuck: If you’re playing for money, no mulligans. Ever. That the first tee shot is hard and nerve-wracking is exactly what makes it so fun. If it’s a very casual game, a breakfast ball is okay, but nothing more.